Jinah is using Smore newsletters to spread the word online. Lesson Summary : Symbols in "To Kill a Mockingbird"
In this lesson students will see two different images to understand a theme of Harper Lee's novel, “To Kill a Mockingbird” by comparing the characteristics of characters represented by the two images: one is an image of a mockingbird and the other one is a mad dog. Using Gliffy, students will draw a graphic organizer and write a few words that can describe each of the images. 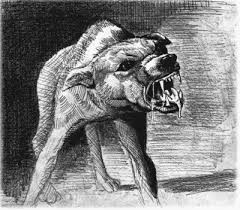 For instance, the mockingbird is weak and innocent, and the mad dog is furious and cruel. Then, at the end of this lesson students will show their graphic organizer to their class. This technology tool, Gliffy, helps students to organize the vocabulary words related to the symbols used in the novel, and they can use the words throughout the lessons when describing the traits of the characters and making connections to the images. It represents people who are defenseless and weak. Sometimes other people take advantage of them because of their weakness. 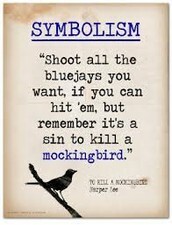 It represents what Atticus has to fight against in order to accomplish justice for the society. One of the big ideas of “To Kill a Mockingbird” is a relationship between justice and prejudice. What does the title "To Kill a Mockingbird" represent? Harper Lee's novel, “To Kill a Mockingbird” is a story about how justice is seen from a perspective of childhood innocence through several events in a small town in Alabama. Trying to imagine Jean Louise Finch (Scout) in To Kill a Mockingbird? Check out Shmoop's visual take on what it's all about. In this lesson students will read Chapter 1 and answer the focus questions: "How do the traits of each character affect their relationships? ", "How are the main characters introduced and how are they related?" Students will use images from Google Slide and add traits of each character including possible background information such as appearance, relatives, etc. after reading Chapter 1. Then, each group will present their own slide to class. While they are presenting, the rest of the students can add any extra information from the presentation on their Character Map. 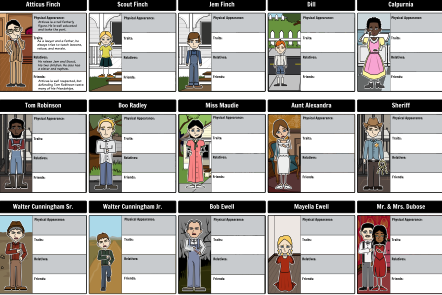 This activity will help them answer text-dependent questions and understand the characters' relationships. In addition, students can build their inferences on how some characters can take a stand for others or not. FREE - Storyboard that is a powerfull tool for rapid creation of visual storyboards for business and schools. In this lesson, students will create an online flyer about taking a stand for inequality using Smore. The teacher will first demonstrate how to add various contents such as images, news articles, videos, music and so on. Before this lesson the teacher has handed out a list of topics representing inequality for students to make a selection, and examples of the possible images related to the themes that can be used for each group’s flyer. Groups of students have assigned to each person what kind of information is to be collected regarding their topic, and already have done some research on it. During this project, students will be encouraged to participate actively and to scaffold what they have learned in class by researching inequality on their own. If time allows, each group will present their flyer to the class and explain why its contents support their claim. Possible Themes in "To Kill a Mockingbird"
- People don't understand someone until they put themselves in other people's shoes. - We should keep fighting even if we know we'll lose. - The world is sometimes very unfair.